Achievement Center of Texas' TBI Center understands the importance of caring for loved ones that have suffered from a TBI. Traumatic brain injury (TBI) is a complex injury with a broad spectrum of symptoms and disabilities. It is an injury to the brain that is caused by an external force such as a violent blow to the head. This results in loss of consciousness, memory loss, dizziness, and confusion, and in some cases leading to long-term health effects, including motor and sensory problems, cognitive and behavioral dysfunction, and dementia. Depending on the impact, it can cause immediate death. TBI is one of the most common causes of neurological dysfunction in the U.S. Each year, about 50,000 people die from brain trauma, and an additional 70,000 to 90,000 have persistent neurological impairments. About 5.3 million Americans live with TBI disabilities. 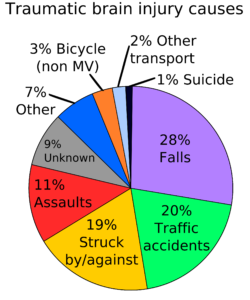 The most common causes of TBI are sports-related injuries, motor vehicle or bicycle collisions, gunshot wounds, falls, assaults, and abuse. Symptoms of TBI may include problems with concentration, depression, dizziness, headaches, impulsivity, irritability, and post-traumatic stress. In severe injuries, symptoms are focal motor, sensory or verbal deficits. Later effects of severe or repeated injuries can include dementia, Parkinsonism, or amyotrophic lateral sclerosis (Lou Gehrig's disease). The families of traumatic brain injury (TBI) victims often have many concerns when their loved one is transferred to a rehabilitative care center. Contrary to regular belief, the TBI patient will be cared for exclusively by a team of professionals who specialize in the care of trauma victims. Stabilize the medical and rehabilitation issues related to brain injury and the other injuries. Prevent secondary complications. Complications could include pressure sores, pneumonia and contractures. The staff will also provide adaptive devices or strategies to enhance functional independence. The staff will begin to analyze with the family and the patient what changes might be required when the person goes home. Each day, the patient will participate in therapy. Initially, the patient may require staff assistance for even the simplest activities, such as the brushing of teeth and getting out of bed to eat. The patient will also need staff for safety because they can become confused or forgetful. The Physiatrist is the team leader in the rehabilitation program. They are physicians that specialize in physical medicine and rehabilitation. Physiatrists treat a wide range of problems, including the changes after brain injury. They assess and prescribe the treatment and direct the team. Many patients are unaware of the changes in the brain and how those changes affect their daily lives. A patient may not understand what has happened and may be distraught by being away from home. Through education and counseling, the neuropsychologist can help assure the patient and the patient’s family. *** More information about the Rehabilitation Team is found here. Achievement Center of Texas has many students with a Traumatic Brain Injury, and we have plenty of space to accommodate all of your individual needs and goals. Click the button below to begin the enrollment process. If you're not ready to enroll your loved one into our TBI center, please donate so that we can continue offering the best services to each individual student. We want to cater to everyone's unique goals and aspirations. This is only made possible through donations from people like you who care. Please click the button below to begin the donation process.